Sampling of plants & wildflowers in all their glory. Thanks for visiting this gallery. All images are copyrighted, but are available for purchase as a print or downloads via the Buy button. In addition to fine art prints, buy lots of neat things with these images, such as a puzzle, key chain, deck of playing cards, or t-shirt. Or contact me via the contact link for any special requests or inquiries. Blossoms from a clone of a small white lady's slipper (Cypripedium candidum) at a central Minnesota native prairie near Westport, Minnesota. Orchids of this genus deceive would-be pollinators that they will be rewarded with nectar. 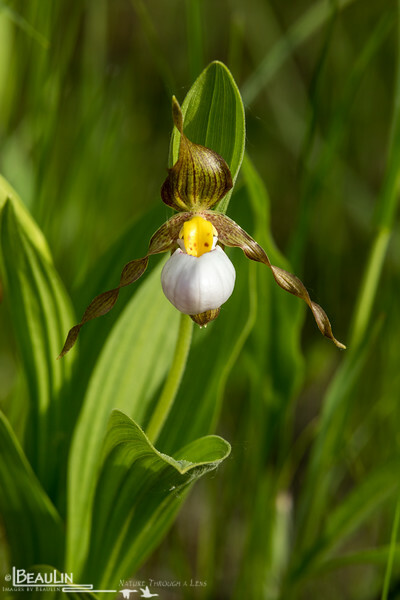 But, Cypripedium orchids don't have nectar. They mimic other flowers that are in bloom during the same time, and also attract flies & bees by eliciting odors that mimic insect reproductive and alarm pheromones.